With a tranquil fishing lake and mature landscaping, there?s a decidedly relaxed atmosphere at the green and spacious Burnham-on-Sea Holiday Village set on the edge of the pretty seaside town. 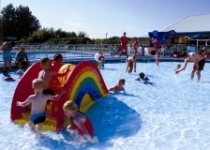 An outdoor pool with lots of grassy terracing, sports courts, playgrounds and a full range of facilities and activities means that there?s plenty of fun for all families. Feel free to fill each day in just your own way. Every family is different of course, but a typical day might begin with a lazy lie in or a family Wake 'n' Shake session. It could be a morning in the Heated Indoor Pool with waterslide or an Archery Coaching session. Lunch out at a great little pub or pop into our Mash and Barrel Lounge-Bar-Caf?. Afternoon on the Tennis Court, off exploring Somerset or enjoying some relaxing fishing by the lake. Early evening enjoy a stroll on the award-winning beach, a sunset bike ride or a barbecue. Then head off to the ShowBar for a drink, live music and dancing. So, whether it's out and about or staying on the Park, you're sure to have a great holiday at Burnham-on-Sea.
? Mash and Barrel: Lounge-Bar-Caf? Opportunities to hand feed and hold many friendly animals, plus an indoor play area. A spectacular Gorge with the highest inland cliffs in the country. The famous Cheddar Caves and Cheddar cheese. Britain's most spectacular showcaves, and home of the infamous Witch of Wookey. Steam through the rolling Mendip countryside by Blue Anchor Bay on a five mile round trip back in time. Explore a medieval house, and go trail finding through 30 acres of gardens. Explore Lorna Doone country and spot wild Red Deer and Exmoor ponies.